Pacific Crest creative director Stephen Estudillo and the corps’ design team had emphasized a couple of key characteristics when preparing to develop a program concept for 2018. First off, the idea needed to be relatable for members, staff and fans. Moreover, it had to connect with the corps’ identity and its history. Simply put, the aim was that all the pieces would fit together perfectly for Pacific Crest in order to properly celebrate its 25th anniversary season. “Here’s to the Ones Who Dream” does exactly that. It all just makes sense; on the surface, the corps’ 2018 program pays tribute to its home city, Los Angeles — more specifically, Hollywood. But upon digging deeper, it’s clear there’s much more that makes the show significant to the southern California corps. Ultimately, the show’s title isn’t just a reference to lyrics from the hit 2016 film “La La Land.” It’s a toast to those who decided to take a leap and found Pacific Crest in 1993. Visually speaking, it’s not hard to tell what’s going on during Pacific Crest’s program. Numerous visual cues allude to the golden age of Hollywood including street lights, “Walk of Fame” stars, tap dancers and more. Pacific Crest debuted its season the weekend of June 29 with events in Oceanside and Pasadena, California. In terms of the music, well-known selections from “La La Land,” aren’t only recognizable to the audience, but, according to Estudillo, allow the corps members to “step out of their shells” when performing. 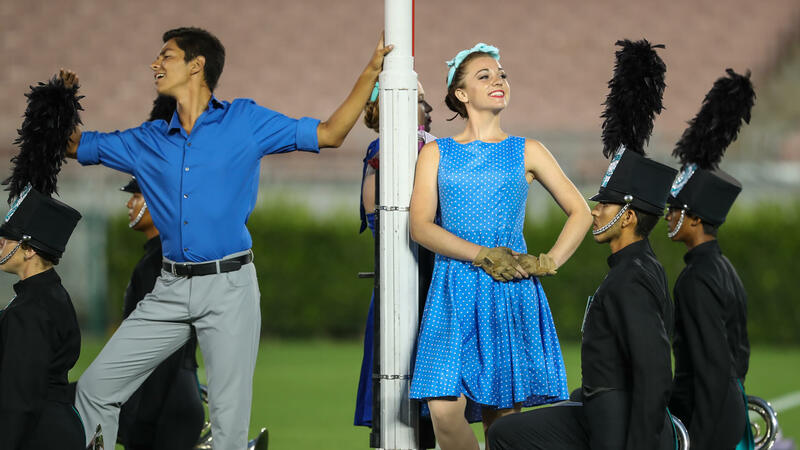 Fittingly, Pacific Crest was able to open up its special anniversary season with “home shows” in Oceanside and Pasadena, the latter of which is staged at one of the most iconic venues in the corps’ home state and the country. Fresquez, who is in his second year on the podium and fifth with Pacific Crest, can attest that his corps, despite being younger than he’s used to, is in a better place at this point than years past. 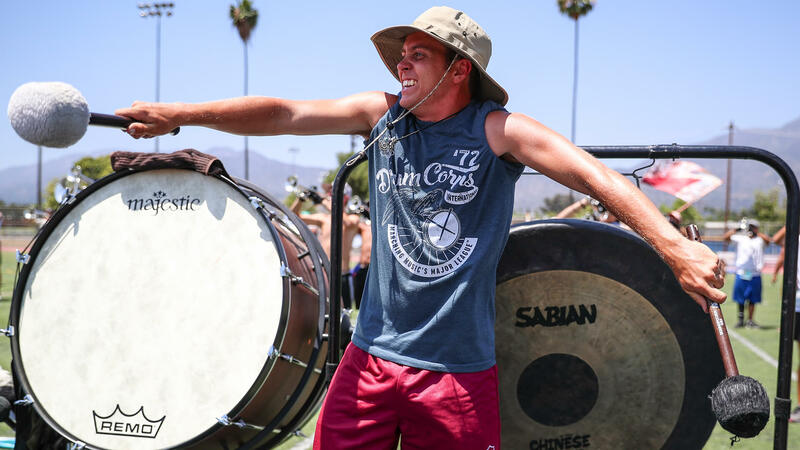 A Pacific Crest front ensemble percussionist reheases June 30 in Pasadena. Early on, those improvements are certainly showing up on the scoresheets. Pacific Crest’s most recent score, recorded in Riverside on July 1, is nearly two points higher than the corps scored on the same date in 2017. 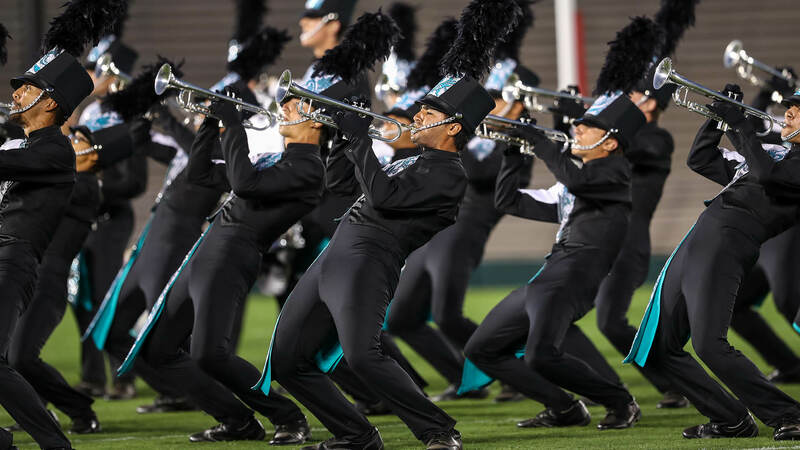 According to Estudillo, the biggest difference year over year from a rehearsal standpoint has been a concerted effort on instruction that accurately correlates to what’s expected of members when they perform. And at the end of the day, between a meaningful, multi-faceted show design and a refined approach to rehearsal, Estudillo is optimistic about what Pacific Crest has going on entering the heart of the ensemble’s 2018 summer tour. View Pacific Crest’s 2018 DCI Tour schedule.